This is a small cascade on Batson Creek right where it joins Carson Creek, pretty much in the middle of Connestee Falls. The combined stream then flows down another set of cascades in a slot in the rock called The Silver Slip. Whether these three named features should be considered three, two, or even one waterfall is up for debate. Nevertheless, it's a very scenic area and well worth a visit, especially since the County bought the land and opened it as a public park. Unfortunately, you can't get to the best vantage point for photography, which are the exposed rocks at the middle of Connestee Falls. Batson Creek Falls is directly across from you there. A NO TRESPASSING sign prohibits you from leaving the rigid safety of the viewing platform and going down to them. Instead, you'll have to get extremely creative and lucky to get a good photograph from the viewing platform. About all you're going to get (legally) is a a distored view of Connestee Falls below you, and a view of Batson Creek Falls partially obscured by tree branches from afar, with a few cascades below the main part of Connnestee Falls in between that and the top of the Silver Slip. It's pretty, and the view down the little gorge is nice even by itself, but it just leaves something to be desired. (I hear that a lower observation deck was planned but cut due to funding issues. If the county gets the funding, maybe a lower observation deck could be built in the future!). 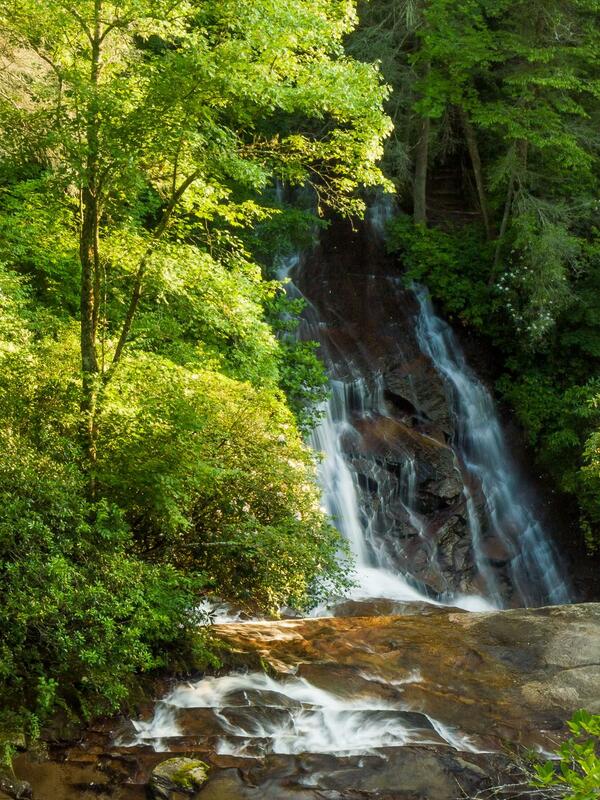 Residents of the private, gated Connestee Falls residential community can hike a trail that you can see ending in a set of steps right beside Batson Creek Falls. From there, there is a view of all the waterfalls from the other side, but this is not open to the public. From the intersection of U.S. Hwys. 276 & 64 in downtown Brevard, take 276 south for 5.8 miles to Connestee Falls Park. The parking area is well signed and on the right. There are a couple of picnic tables here as well. A paved ramp leads to a level and sturdy concrete, wood, and steel boardwalk structure. This leads about two hundred feet to an observation deck at the top of the falls. It's completely safe, kid friendly and ADA-accessible. The waterfall below you is Connestee Falls; look downstream to find the little waterfall joining on the left, which is Batson Creek Falls.